After making my last batch of dough I had a little left over. I wanted to do something little different and wasn’t in the mood for a red sauce so why not shrimp scampi pizza. It’s simple, easy, and fresh! 3-5 cloves garlic minced, depending on how garlicky you want it. Add shrimp, cook about 2-3 minutes on each side. The shrimp will cook more once in the oven, so try not to over cook. Once shrimp are cooked, remove from pan and set aside. Simmer until sauce has reduced slightly about 5 minutes. Add the remaining 1 tablespoon of butter and chopped parsley. To assemble pizza. 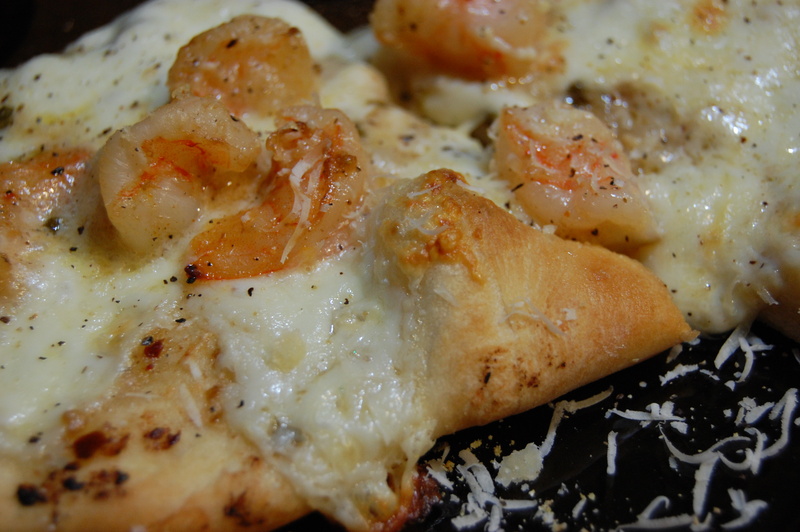 Spread scampi sauce over dough, top with your choice of mozzarella cheese, add shrimp and finish with freshly grated parmesan. Bake at 450 on a pre heated pizza stone until cheese is bubbly and crust is golden. I love to make my own pizza and that one looks so good thanx for the recipe.